As a sporting nation, our enthusiasm for our favourite pastimes is often equalled by our passion for collecting sporting memorabilia and collectables. Golf has a long history and tradition, which is reflected in the demand for early golf clubs and golf balls. In particular, hickory-shaft golf clubs are sought by collectors for their early makers and unusual variations. An early cylindrical roller putter is one such unusual club that can fetch up to £600-£700 at auction. A collection of Devon rugby caps and football medals (SC15/231). Football and rugby are the most obvious sports for collectors and it is the early formative years of both that create the most demand. Early 20th century football programmes are desirable as many of the clubs we know and support today had only been established in the late Victorian period. An Arsenal football club programme from 1906, in good condition, will easily fetch £1,000-£1,500 in a sporting sale. 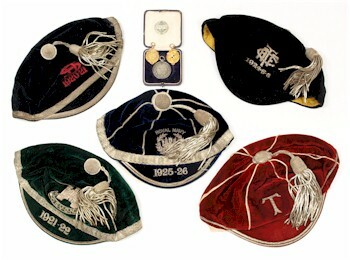 Rugby collectables and memorabilia form the same period are equally desirable, as seen by the collection of Rugby caps seen here. Team photographs and caps such as those illustrated here and awarded to players for representing their county or for international rugby matches, are often as much as £800-£1,000 for such a group.